Britain's Prince Charles and his wife, Camilla, will visit sites across the Washington area next week during their U.S. visit. The British Embassy announced Monday that Prince Charles and the Global Ocean Commission will host a meeting March 18 on the threats of marine plastic waste with environmental groups and major companies. 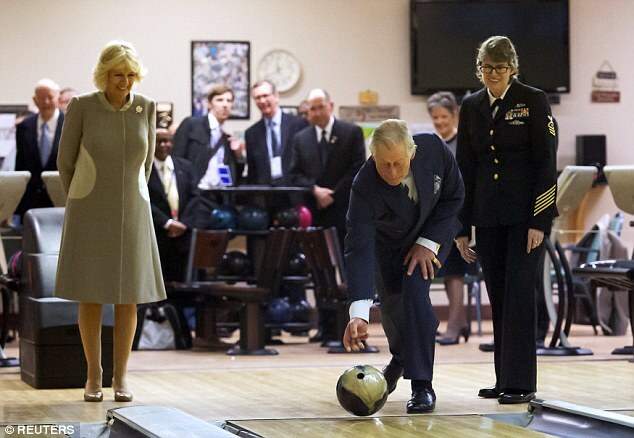 In addition to meeting with President Barack Obama during their visit, Prince Charles and Camilla will also visit the Armed Forces Retirement Home and George Washington's estate at Mount Vernon in Virginia. Camilla will visit Washington's Shakespeare Theatre Company for a tour and to view a short production. Prince Charles also will visit the U.S. National Archives to mark the 800th anniversary of Magna Carta and the Carlos Rosario Public Charter School, which provides adult career training. ^Heheh. I couldn't find an itinerary. Must be one somewhere. Prince Charles and Duchess Camilla played tourist on their first full day of their Washington visit on Wednesday, visiting several historic landmarks. And Charles the organic farmer got to do one of his favorite things — explore George Washington's Pioneer Farm at Mount Vernon. from the article they seem to have a very busy visit planned. The UK has decided to join the Chinese organized Asian bank - against the wishes of the US so perhaps this is a make nice visit. Usually, I like what Camilla wears, but today she was wearing colors that were too dark, and I'm tired of those boots. It's not winter, spring is nearly here, she should wear brighter colors. The photo of Camilla in New Orleans in 2005 reminded me of how she was photographed at that time walking among the destruction, grinning her big grin and carrying a gift bag. The Prince of Wales and Camilla, the Duchess of Cornwall, ended their second day in the U.S. with a glitzy night out with friends in Washington D.C. The couple, who will celebrate their 10th anniversary next month, put on their best dress for a dinner hosted by Barby Allbritton, the head of the prince's charity in the U.S. and the widow of Joe Allbritton, who owned news stations and the website Politico. The Allbrittons were so close to the British royals that they were two of a few Americans invited to the Royal Wedding between Charles' son Prince William and Kate Middleton in 2011. 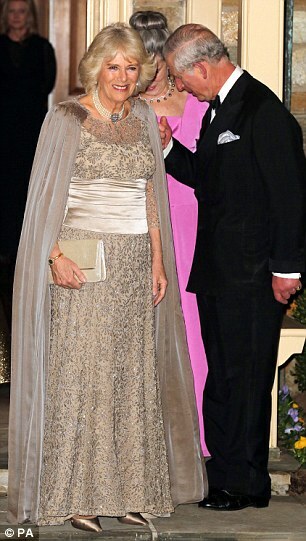 Charles and Camilla joined Mrs Allbritton, her son Robert - who now runs Politico - and his wife Elena for the black tie charity affair on Wednesday night. The event was so secretive that other guests were only given the address earlier in the day, PageSix reported. ^I must say, as a US citizen, that that MLK statue is just plain awful. Hideous, really. Looks like it belongs next to Mao or somebody. That was a complete mess from the get-go. 'Hope the Prince and Camilla are enjoying themselves but these are some odd visits, to me. The gardens, Vernon, all of that makes sense but civil rights to a monarch and shoving the Declaration of Independence into the mix? I dunno. Maybe they've never read it. I am surprised we have a Maga Carta copy - would have thought they were all in the UK. The archives were a good place to visit and since he was there - well of course he has to see the Declaration. President Obama told Prince Charles that Americans like the British Royal family more than their own politicians in a meeting at the White House this afternoon. When the 66-year-old said that news was 'awfully nice to know,' Obama added, 'They like them much better than they like their own politicians. Charles met Mitch the turtle! Because some of the politicians say the downright stupidest things imaginable that is more detrimental and dividing to the country than uniting. It's a wonder they passed fourth grade. I say, again...Mitch the turtle! 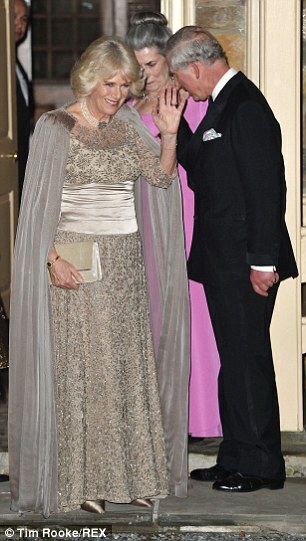 I'm not sure about the side panels on Camilla's coat, was the designer trying to give her a small waist? 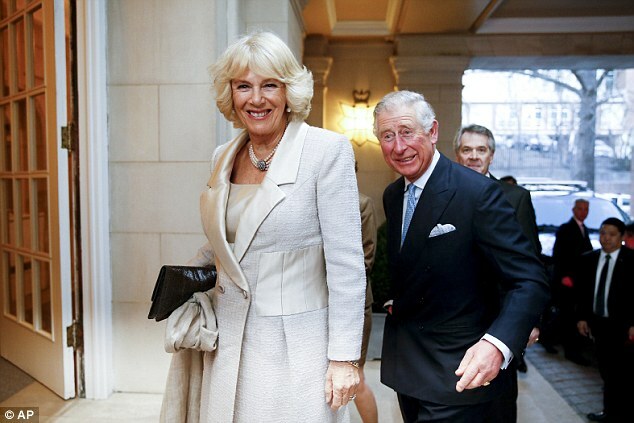 Just like Kate, I've noticed that Camilla loves looking for the cameras. Prince Charles has turned around to talk to some hosts and she is just standing there posing and ignoring the people behind her. Not sure what to make of this gown, again there is a huge panel trying to give her a small waist. Those days are ova, Cam. Amazing to think he has received an environmental award, while squandering resources so he can live in the lap of luxury. So they were in my hometown of today, and everyone went nuts! I couldn't get past the traffic downtown just to get to work! Is this what you Brits put up with all the time? If so, I empathize with you lot! It's not like royals never say or do anything stupid, are they the best and brightest, or morally upstanding. The only reason why some Americans love the royals more than our own politicians is because they're stuck in some Cinderella dream of glitz and glamour and because they don't have to foot the bill for these people. Not to mention most of the monarchies still in existence are shells of their former and original selves or watered down if you will. They'd be singing a different tune if they actually ruled by these people. The grass is always greener on the other side until you're actually on the other side and you find out that's far from the truth. Here, in America, that's just a throw-away comment by Obama meant for a cynical laugh at ourselves. Meaning, I think anyway, that we always beat up on our politicians here so it wasn't meant literally. How ridiculous. In my crowd and pretty much everywhere I go there just isn't that overwhelming love for the royals or interest that the press seems to think is there. Momentary interest? Sure. Long-term fascination? No. A small pocket maybe. If I stopped and asked anyone on the street here who from the royal family is visiting the US this week I'll betcha nobody would know the correct answer. The copy of Magna Carta in the US is a later than 1215 one (same as the one we have here in Australia). There are four 1215 ones still in existence - 2 in the British Library/Museum, 1 in Salisbury cathedral (or is in Winchester) and the 4th at Lincoln. The copy you have was the Queen's 200th birthday gift to the US as the US laws are somewhat based on the Magna Carta and subsequent British legislation although of course there are variations as well. One of the reasons for this tour is because of the 800th anniversary of Magna Carta. I also believe that a handwritten draft of the Declaration of Independence by Jefferson is on display at the British Library as part of that bodies' Magna Carta exhibition and Charles opened that exhibit a few days before he went to the US. The trip highlights the fact that some of the ideas of the US and the UK with regards to legal systems etc are based on documents dating back into the 1200s.